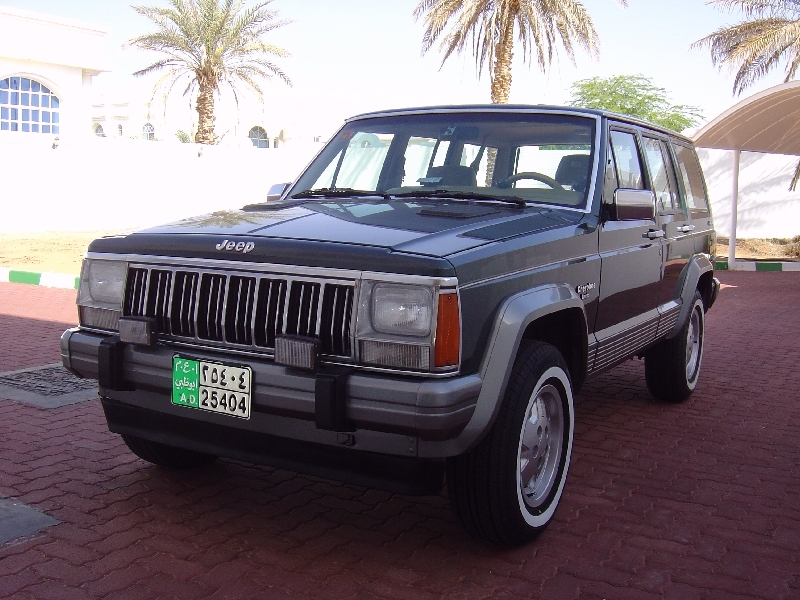 I'm the proud owner of a 1992 Jeep Cherokee XJ Laredo with an inline 6cyl. 4.0L High Output engine, AX15 5-speed manual gearbox, NP231 Command-Trac transfer case, stock Dana 30 front axle, stock Dana 35 rear axle with Traclok LSD, stock 3.07 axle gears, UpCountry suspension/HD gas-charged shocks/rear anti-sway bar/skidplate/tow-hook package. As a self-confessed petrolhead, I like my vehicle to look and perform at its best. Performance, fuel economy, reliability, handling, ride, efficiency and practicality are important to me. The Jeep Cherokee is already a multi-talented vehicle right from the factory, and this website is dedicated to making it perform even better. I bought my XJ in September 1995 one month short of its 3rd birthday. It had 41000 miles on the odometer and had been kept in excellent condition by the previous owner. It came with a full dealer service history so it was too good to resist. It has Hunter Green metallic paintwork with metallic silver/grey lower body cladding and bumpers. It also has factory-installed bumper-mounted foglamps. The grille, headlamp bezels, door mirrors and door handles are chrome. 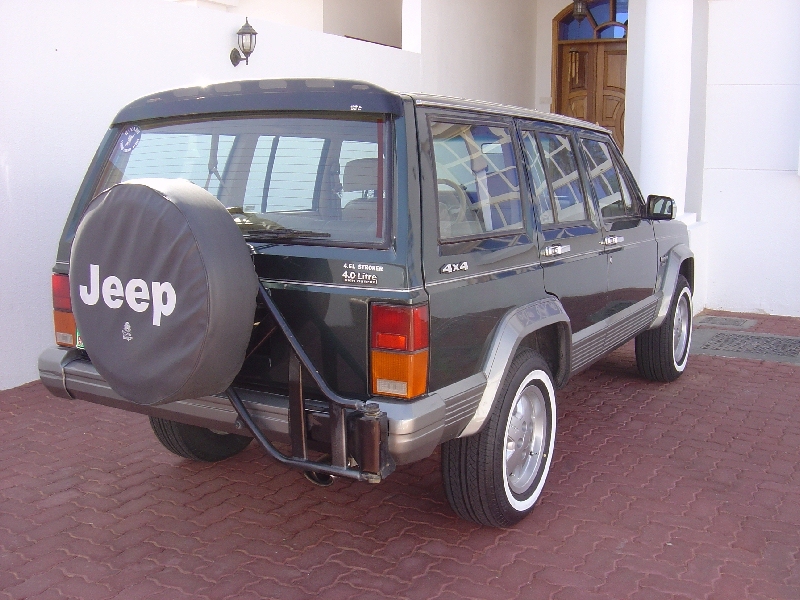 My XJ was bone stock with 215/75R15 tires on 5-spoke alloy wheels. Acceleration was top of the class for a sports utility vehicle at the time; 0-60mph in 7.7secs, 0-100mph in 25.5secs, and a 1/4-mile time of 16.3secs @ 85mph put it on a par with performance sedans and hot hatchbacks. Not surprising with a healthy 193hp/239lbft pulling a vehicle weighing only 3525lb (1600kg). Unfortunately the overdrive 5th gear pulled a very tall 34.0mph/1000rpm, so acceleration in this gear was weak but it was good for fuel economy at highway cruising speeds. Gas mileage in mixed driving averaged 20.7mpg. Not bad for a 4.0 liter-engined vehicle with brick-like aerodynamics. The 4.0L engine is in a low state of tune in stock form (see power ratings below) so I knew that more horsepower/torque could easily be extracted from it. By making the engine more efficient, there was also the potential for better gas mileage. My goal was to increase useable torque throughout the rev range. This would improve acceleration in all gears with the change being most noticeable in the higher gears. The idea was to apply simple bolt-on modifications that can be done by any competent DIY home mechanic. Forced induction by way of a turbocharger, supercharger, or nitrous oxide injection was not on the agenda. An improvement in performance while maintaining fuel economy and reliability was the main goal. Update 22nd January 2004: By this time, a whole crop of newer sports utility vehicles and hot hatchbacks had appeared on the scene and they'd raised the performance bar much higher. Even with all the bolt-on performance mods in place, my Jeep's performance was still only cruiserweight and I couldn't allow it to be embarassed by a smaller hot hatch upstart! A serious increase in horsepower/torque was needed to re-establish my Jeep's position as a performance heavyweight and since forced induction was ruled out, the only choice left was to fit an engine with more displacement. I therefore decided to build a 4.6L stroker engine based on a junkyard 4.0 in my spare time. I finished it by the 28th June and had it swapped in over the next three days. The details are here. The result was exactly what I'd hoped for so read on to find out the full story. The '87-'90 engines had Renix electronic multipoint fuel injection, electronic ignition, a single 51mm (2.0") throttle body, and a rather inefficient low port cylinder head. In 1991 engines received Chrysler sequential MPFI, a larger 60mm throttle body, revised intake and exhaust manifolds, and a more efficient high port cylinder head. As a result, these engines produced 13hp more than their predecessors and gained the "High Output" designation. In 1996 engines received noise, vibration, and harshness fixes. The blocks were stiffened with extra ribbing, a main bearing brace was added, and lighter cast aluminium pistons were introduced to reduce cold start piston slap. Engines also received revised camshaft timing for more low rev torque. In 2000 a distributorless coil-on-plug ignition system was installed, the cylinder head was revised with smaller exhaust ports for a faster warm-up of the catalytic converters, the intake manifold was revised with curved runners of smaller cross section, exhaust manifolds were revised with a dual outlet, a 2-into-1 exhaust downpipe with small precats was added, and a more efficient slitter vane water pump was included.